Thanks to Office 365 and the Logitech Conference Cam Connect the tools to do basic conferencing have never been cheaper and easier. As you can see from the above image the Logitech Conference Cam Connect comes in a really neat form factor that includes the ability to broadcast video, sound as well as project to an external HDMI source. The unit is portable and includes a battery as well as being Bluetooth enabled. The easiest way to use the Logitech Conference Cam Connect is to connect it via USB to a PC and use it with Skype for Business. In small conference room environments it works really, really well. You can also connect it to your mobile device using Bluetooth and mirror what is on the screen and then output that to a HDMI TV connected to the device. You get all this for around $700 which is really great value I reckon. However, please remember that this i an entry level device. It can’t for example (unfortunately) run via USB and project to an external HDMI screen at the same time. To do that you’ll need to spend more money on dedicated conferencing hardware. Those minor limitations aside, the combination of this device and Skype for Business via Office 365 provide a hugely price effective entry level conferencing option for many businesses who could never afford the option previously. I really like the fact that it is portable and runs on batteries so you can put it just about anywhere. I have been taking it with me recently and using Skype Meeting Broadcast to live stream a number of events I have been presenting recently. I also like the ability to easily ‘cast’ from most mobile devices to a HDMI monitor using it. 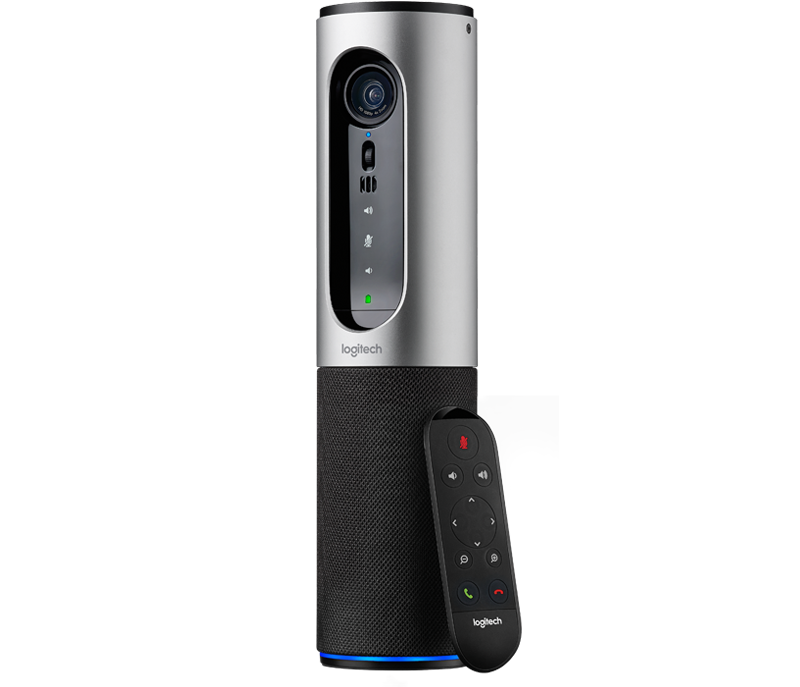 If you have been considering the benefits of conferencing and have Office 365, I’d look at adding the Logitech Conference Cam Connect as a low entry point to giving your business extra flexibility for meetings. Sure, your needs may grow over time but this little device will work well now and well into the future. A nice new feature that Microsoft has added across SharePoint Online, including OneDrive for Business, is the ability to whitelist or blacklist domains for sharing. You’ll need to login to the Office 365 web console as an administrator. You’ll then need to navigate to the Office 365 Admin center as shown above. From here, select the Admin icon on the left and then SharePoint from the menu that appears. From the menu that appears on the left select sharing. You should now see the sharing control options as displayed above. Under the Additional settings, when you select the option Limit external sharing using domains the above box and selector appears. Here you can now prevent sharing to specific domains by selecting the Don’t allow haring with users from these blocked domains or only allowing sharing to specified domains using the Allow sharing only with users from these domains option.. Thus you can either block a list of domains or allow access only to a list of domains, you can’t do both simultaneously. Once you apply these settings they will be applied across both Teams Sites and OneDrive for Business for all users. This now gives you an easy method of controlling which domains you allow your users to share information with across everything in SharePoint Online. I am giving a presentation at the April meeting of the Sydney SharePoint Users Group on the Tuesday the 19th April at 5.30pm at the Sydney Mechanics School of Arts, 280 Pitt Street NSW, which is now even more relevant in light of the changes coming to SharePoint Online. You can follow the group on Facebook at www.facebook.com/SharePoint.Sydney. On Twitter, use#SYDSP. Also via Meetup. In a world challenging installations of traditional technologies like SharePoint with new products from Office 365 like OneDrive for Business, Delve, Planner, Yammer and Groups is SharePoint becoming irrelevant? Worse still, is SharePoint becoming a new world version of the old world file share? Attend the interactive session to understand and discuss what new products like Delve and Office 365 Groups bring to the modern workplace and the way people get work done and especially whether SharePoint as we know it still has a place for the information worker. Registration: To help get an idea of numbers for this event, please register for the event using the links above. 1. I am coming at this new interface with a certain ingrained bias. Firstly as an IT ‘dude’ and secondly as a long time SharePoint user. I’ve been working with SharePoint Document Libraries for a very long time inside Team Sites and any changes I see are always viewed through this lens. Many others don’t have these long standing biases. 2. There were some issues with the initial roll out of the new look Document Libraries to my tenant and for some reason the navigation on the left of the screen (that shows the remainder of the Team Site) wasn’t displaying. As you can see in the above image, the Quick Start Menu is now basically rendering which does make navigation much better and far less siloing than I thought when I initially saw the new format. I will however note, that at this stage the traditional Top Link Bar doesn’t display in the new format. In most cases you use the Top Link Bar to navigate to different locations (i.e. Subsites) within your structure. – This new look and feel for Document Libraries is part of a much broader set of changes that are coming to SharePoint Online. Microsoft has yet to fully announce these plans but we should expect to see an announcement at the Future of SharePoint event, on the 4th of May, which you should sign up for. 1. The update is currently available only to those on office 365 First Release but will eventually roll out to all users. which allows you to control the default experience. I haven’t yet found where an administrator can set the default experience but it does seem to indicate that it can be configure across the whole Team Site. Hopefully, there will also be a way to set this using PowerShell. 3. You can now upload folder to a Document Library. As you can see from the above, you can now upload folders directly into a Document Library. This is not possible directly using the ‘classic’ interface. This going to make getting information into SharePoint Online much easier. 4. The new grid layout makes things look at lot like Delve. In the top left you’ll find the All Documents menu that allows you to flick between your different existing Views but also to swap to a Grid. This makes the page look very much like Delve, which I personally believe is where Team Sites are headed towards. 5. You can now easily pin a document to the top of a library. When you select a document from the library, you’ll now see a Pin option at the menu across the top of the page. This allows you to have that document(s) highlighted at the top of the page as shown above. Again, very reminiscent of Boards in Delve to me. 6. Sharing is now easier. Again, when you select a file a new Get a link menu item appears that allows you to quickly and easily share a file with other just by creating a link as shown above. You can still go via the Share menu item to achieve this, but the new Get a link menu item make things much clearer I believe. 7. Right mouse clicking a file still works. Right clicking on a file still brings up a context sensitive menu as you can see above. 8. The ability to add columns to the view is now much easier. If you select the three dots at the right of the column headings a menu will slide in from the right allowing you to select exactly which columns you want to display. This is much easier for an user to work with than going through and having to create separate Views. 9. You can enable the information blade. If you select the i icon with a circle in it in the top right hand corner an information blade appear on the right that display the properties of the file you have selected. Here you get a preview, can edit other information about the file, view sharing and so on. the information in the blade updates as you select different files. This is a much better method of exposing file information for users than having to go through the ‘classic’ Ribbon Menu. 10. The Ribbon Menu has been deprecated in the new interface. As you see from the ‘classic’ interface the Ribbon Menu was a major major way people interacted with the Document Library. However, for most users, the ribbon contained buttons they could use, didn’t understand what they did or were just so small they couldn’t read them. The new interface is a lot cleaner and easier for the ‘average’ user to work with (not a crusty old SharePoint person like me). One of stumbling blocks for SharePoint was that it was, well, SharePoint. There are some strong reservations about using ‘SharePoint’ based on previous bad experiences. Even when new and improved versions come along, these old biases are hard for many to shake. Having SharePoint not look like ‘old’ SharePoint makes sense when it comes to wider adoption. So in summary, there is plenty to recommend this new look and feel for Document Libraries. It is important to remember that we are in the middle of a transition to a new way of doing things with SharePoint so we’ll have to wait and see what happens when all the pieces fall into place. I will however say that changing Document Libraries is changing the fundamental way most users work with SharePoint and I would contend, files in Office 365. That is going to impact a lot of people. That is going to mean a change for most and change is always a hard sell. At the moment we are in transition and change is coming slowly, but it will still freak a lot of people out. The more used to ‘traditional’ SharePoint they are, the more freaked they are going to be (at least initially). Those who have invested a lot in their Team Site look and feel are going to face challenges with these changes as the interface in the new look and feel is, at the moment at least, completely different and also doesn’t as yet carry across much existing Team Site theming. Having a different look and feel could be quite jarring for some. We are yet to see how traditional navigation (like the Top Link Bar) will be handled along with some other traditional SharePoint elements. I’m sure however all will be revealed very soon but I expected SharePoint Teams Sites to become more and more like Delve every day! Which you should look at for more information. One of the big points I make about SharePoint Team Sites is that they are designed for collaboration rather than just storage. This means Team Sites are typically designed to contain not only files but contacts, lists, calendars and so in a structure that make sense for the business. The way many refer to it is as an ‘Intranet’, i.e. a web site full of information (not just files). Microsoft is preparing an update to Team Site Document Libraries which I believe discourages the core of what Team Sites are all about, that is, collaboration. When you visit a Document Library in a Team Site now you’ll see the above message asking you to Check it out. When you do, you see the new interface as shown above. You’ll note that Document Libraries appear very much like the new OneDrive for Business interface. Problem for me is that I believe this silos information. The new interface is fine for OneDrive for Business because that is effectively a silo for each users own ‘stuff’ but in a Team Site it doesn’t make sense to me because they are designed to be accessed by multiple people. If you compare this to the ‘classic’ interface above, you can see how many more options the ‘classic’ interface provides. It allows you to see the whole structure, other elements, all the navigation options as well as any theming. The new interface basically takes you to a place where you only see a simplified version of the files in that Document Library. That isolates, or silos you from other information and effectively prevents collaboration I would suggest. I appreciate the desire to have a simpler interface for average users but if we go down the path of wide spread adoption of this new interface it is simply going to reinforce the notion that SharePoint Team Sites is nothing more than a file repository, a dumping ground for files if you would. As I said, I think the new interface is fine for OneDrive for Business but I don’t feel it is appropriate for Team Sites, because these should be designed for encouraging users to share, not taking them to places where they can only see a small subset of the information. I would also contend, that having this new interface also creates a marked difference between the ‘normal’ Team Site interface and Document Libraries. That difference makes it harder for users to understand and work with because it is inconsistent. In short, I don’t this new Document Library look and feel is going to help Team Sites be more about collaboration. I fear it simply reinforces the current perception that Team Sites are just old world network shares in the cloud, which they ain’t! One of the first things that many people want to do with Azure is set up a Virtual Machine (VM). Here is the process to follow to do that from the new Azure portal using the new Resource Manager configuration. Please note that this post is only gong to cover creating a single, stand alone virtual machine (VM). if you want to create a group of virtual machines that are on the same network in Azure look out for future posts on that topic. To commence this process login to the Azure management portal via https://manage.windowsazure.com. This will log you into the ‘classic portal’ as shown above. Here you can create VMs but they won’t be using the newer Azure Resource Manager (ARM), this can only be done via the new Azure portal. To navigate to the new Azure portal select Check out the new portal at the top of the page as shown. You can also get to the new portal by selecting the account name in the top right and then the option Switch to the new Azure Portal from the menu that appears. The new Azure portal should look something like the above with a number of menu options on the left. From these menu options on the left select New. A ‘blade’ will then appear to the right. From this blade select Virtual Machines. A further blade will appear listing all the VM images you can select from. What appears here will depend on your Azure subscription. In this case the Windows Server 2012 R2 Datacenter VM will be selected. A further blade will open with the details about the select VM. At the bottom of this you will see an option for the deployment method. Ensure this is set to Resource Manager and then press Create to continue. You’ll now be stepped through entering the remaining details for the configuration of this VM. The first step will require you to enter a machine Name, login User name, user Password, Azure subscription, Resource Group and Location for the VM. The VM name, user login and password have to conform to certain standards. The Azure subscription doesn’t normally require altering. In this case, enter a name for a new Azure Resource Group (in this case rg1). Finally, the location option is the datacenter where you VM will be homed. When complete press the OK button to continue. You’ll then be taken to Step 2 where you’ll be prompted to select a VM type. By default, you’ll only see VMs that Azure recommends. To see all the options available to you, select the View all link in the top right as shown above. In this the A1 machine has been selected. Press the Select button to continue. In Step 3 you can view and edit of the other pre-configured options required for the VM. In this case no changes will be made so select the OK button to proceed. Don’ forget to scroll down on the right to see all the options available here. Step 4 will show you a review of all the options you have selected for this VM. You should now see a message, like that shown above, that tells you that the deployment has commenced. You can always see you messages by select the Alerts icon along the top of the window as shown. Select the blue refresh icon to the left of the text as shown. This will give you more information about the deployment progress. If you scroll down to the bottom of the list you will see the deployments actions that have been undertaken and their success as shown above. If you select the Virtual Machines option from the menu on the left you should see the new VM listed. You should also see that it’s status is Creating. A new blade should open giving you more information about the VM as shown above. You can select any of Settings here to get more information. After a short period of time, you should receive a console message telling you that deployment is complete. To connect to this new running VM via RDP simply select the Connect icon at the top of the blade as shown. You will then be prompted to download and run an RDP connection stub. When opened you’ll need to enter the user name and password you created earlier for that VM. Once you have done that correctly you should be connected to the VM as shown above. Now you can interact with the VM as you would any other machine you have remoted to. If you return to the Azure portal and select the Resource groups option from the menu on the left, you should see the new Resource Group you created as part of the VM configuration (here rg1). Select the new Resource Group you created during the VM set up process. A blade will open showing all the resources that are of this group. This is the big difference between ‘classic’ VMs and the new Resource Manager VMs. All the items (such as storage, networks, etc) are place in a container called a Resource Group. This makes management much easier. If, for example, you select the network from the list of resources, a further blade will open, as shown above, giving your insight into that resource. Resource Manager is now the preferred method of working with Azure and provides many benefits over the previous ‘classic’ model. More about Azure Resource Manager (ARM) will be covered in upcoming posts. and Virtual Machines in the ‘classic’ portal you won’t see your new VM. That is because Azure Resource Manager VMs only appear in the new portal and are using a newer deployment method (i.e. not ‘classic’). Thus, you now need to use the new Azure portal to work with this VM. You can of course also use PowerShell but that will be covered in another post. The above process has given you a walk through of creating a stand alone Azure VM using the Resource Manager deployment option. Upcoming posts will detail how to create a network and place multiple VMs inside it. The recent Microsoft build conference reinforced to me the fundamental change that is taking place with technology. For me what really stood out was the fact that ‘bots’ are now front and center of businesses like Microsoft. They are providing the framework for greater automation as the above video highlights. Although this is a longer video from Dan Pink, I really urge you to watch and listen to the message it contains. In essence, what Dan is saying is that anything where the steps can be written down will be automated. This means that only creative, or right brain jobs, are those that will survive in the future. Think about that in light of IT. More and more tasks are being outsourced overseas to at labour rates that are much cheaper but in many cases at a higher competency rate. Tools like PowerShell, If This Then That (ifttt.com) and Zapier (zapier.com), Microsoft PowerApps and the new Office 365 Connectors are only the start of the automation that technology will bring us. Finally, it is going to be almost impossible to sell a product that isn’t unique in an age where you competition can come from virtually anywhere on the globe. The Internet of Things (IoT) is going to bring us not only automation on a unprecedented scale but thanks to machine learning the bots are going to know more about you that you know yourself. They’ll know where you go every day at 9am, they’ll know what meals your prefer, who you regularly talk to and when, your favourite holiday destinations and hotel and more. This is all thanks to the explosion of not only big data but also automation. The funny thing is that I see so many people in IT who believe they are at the cutting edge of technology because they install the latest OS onto a desktop or server. Nothing could be further from the truth. Thanks to Windows 10 updates with AUTOMATICALLY be installed. Thanks to Windows 10 new features will AUTOMATICALLY be installed. Thanks to click to run Office updated and new features will AUTOMATICALLY be installed. See the trend? Automation rules. Services like Azure that allow infrastructure to be migrated to on-demand data centres where you only pay for what you need. They also allow the consumption of services that were once only available to the biggest businesses, now available to all. They are also moving to complete software as a service (SaaS) offering, where you don’t even need to worry about what makes the stuff tick. It scales automatically as demand increases and whose costs decrease as it become more commoditised. All this speaks to rule number one above, can someone else do it bigger, better, faster? Yes, they sure can when it comes to IT. If you are selling Managed Services today, how is your business any different from your competitors? You use the same tools. You provide the same type of service. You are simply maintaining the system, not really adding value. We are already seeing the MSP market become commoditised. This means the only path to sustainable profitability is with scale. I can’t see many in the MSP being able to scale to a level to maintain profitability thanks to growing outsourcing and automation. and prepare for the changes that are on our doorstep today. Enterprise Yammer is part of every Office 365 plan that includes SharePoint and is also now enabled by default. Yammer Enterprise is a business social network that allows people in your company to easily share information in way that it makes contribution easy and search simple. This video tutorial will take you through the basics of Yammer, show you the different versions as well cover how it integrates with Office 365. Yammer is an important product that businesses with Office 365 should be taking full advantage of. This tutorial will provide you the information that you need to get up and running with Yammer in your organisation.